HOW TO USE: Take this medication by mouth, usually twice daily or as directed by your doctor. Take lithium with or immediately after meals to lessen stomach upset. Do not crush or chew this medication. Doing so can release all of the drug at once, increasing the risk of side effects. Also, do not split the tablets unless they have a score line and your doctor or pharmacist tells you to do so. Swallow the whole or split tablet without crushing or chewing. Drink 8 to 12 glasses (8 ounces or 240 milliliters each) of water or other fluid each day, and maintain a healthy diet with normal amounts of salt (sodium) as directed by your doctor or dietician while taking this medication. Large changes in the amount of salt in your diet may change your lithium blood levels. Do not change the amount of salt in your diet unless your doctor tells you to do so. Use this medication regularly to get the most benefit from it. To help you remember, take it at the same times each day. Dosage is based on your medical condition, lithium blood levels, and response to treatment. This medication works best if the amount of the drug in your body is kept at a constant level. Therefore, take this drug at evenly spaced intervals. This medication must be taken exactly as prescribed. Continue taking lithium even if your symptoms are improved. Do not stop taking this drug suddenly without consulting your doctor. Some conditions may worsen if the medication is suddenly stopped. Tell your doctor if your condition persists or worsens. It may take 1 to 3 weeks to notice improvement in your condition. DRUG INTERACTIONS: Your doctor or pharmacist may already be aware of any possible drug interactions and may be monitoring you for them. Do not start, stop, or change the dosage of any medicine before checking with your doctor or pharmacist first. This drug should not be used with the following medication because a very serious interaction may occur: sibutramine. 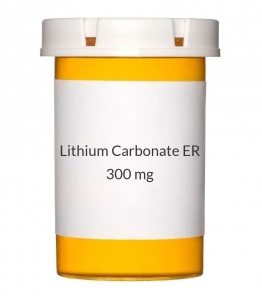 If you are currently using this medication listed above, tell your doctor or pharmacist before starting lithium. Before using this medication, tell your doctor or pharmacist of all prescription and nonprescription/herbal products you may use, especially of: acetazolamide, ACE inhibitors (e.g., captopril, enalapril, lisinopril), angiotensin receptor blockers (ARBs such as losartan, valsartan), bulk-producing laxatives (psyllium), calcitonin, calcium channel blockers (e.g., verapamil, diltiazem, nifedipine), desmopressin, other drugs for mental/mood conditions (e.g., chlorpromazine, haloperidol, thiothixene), methyldopa, metronidazole, nonsteroidal anti-inflammatory drugs (NSAIDs such as celecoxib, ibuprofen, indomethacin, naproxen, piroxicam), anti-seizure drugs (e.g., carbamazepine, phenytoin), SSRI antidepressants (e.g., fluoxetine, fluvoxamine, paroxetine), theophylline, tricyclic antidepressants (e.g., amitriptyline), "water pills" (diuretics such as hydrochlorothiazide, furosemide). Maintain a normal diet with an average consumption of sodium. Consult your doctor or dietician for more details. Avoid products that contain sodium (such as sodium bicarbonate, an ingredient in some types of antacids). This document does not contain all possible interactions. Therefore, before using this product, tell your doctor or pharmacist of all the products you use. Keep a list of all your medications with you, and share the list with your doctor and pharmacist. MISSED DOSE: If you miss a dose, take it as soon as you remember unless your next scheduled dose is within 6 hours. In that case, skip the missed dose and resume your usual dosing schedule. Do not double the dose to catch up. STORAGE: Store at room temperature between 59-86 degrees F (15-30 degrees C) away from moisture and light. Do not store in the bathroom. Keep all medicines away from children and pets. Do not flush medications down the toilet or pour them into a drain unless instructed to do so. Properly discard this product when it is expired or no longer needed. Consult your pharmacist or local waste disposal company for more details about how to safely discard your product.